The Dark Age of Britain, from the middle of the 4th century to the end of the 8th, was a time of violence and warfare, when charismatic warlords such as the fabled King Arthur could gather together armies and carve out their own kingdoms. With this new set of wargames rules, players can take on the role of these warlords and command their own armies on the tabletop. 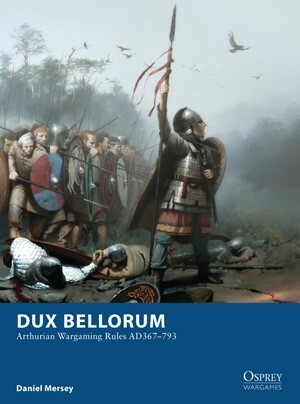 Written by the author of the popular Glutter of Ravens rules set, Dux Bellorum is an element-based system, where each base of figures represents 50 fighting men. Each player has a specific number of points with which to construct his force and can choose a Late Roman, Romano-British, Welsh, Saxon, Pictish, Irish, or Sea Raider army, amongst others. The game is then played out following a set of simple, fast-paced rules. A completely self-contained gaming system, Dux Bellorum is perfect for gamers who are looking for a way into fighting Dark Age battles without investing a lot of time or money in larger rulesets.